Think you know the great outdoors? 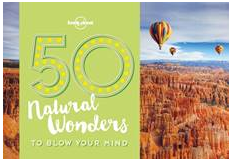 Lonely Planet's 50 Natural Wonders to Blow Your Mind, published this month, will make you think again. Walk over a bridge formed of living tree roots in India. Take a boat cruise through New Zealand's dark caves magically lit with thousands of glowworms. Marvel at the sheer scale and beauty of the USA's Grand Canyon. "The staggering statistics tell a story in themselves – this is the world's largest single structure made from living organisms; so huge, in fact, that it can be detected from space. It is made up of over 2900 reefs and 900 islands that stretch for over 2300km. But all you'll really notice, once you dive down, is the rainbow of marine life that crowds around you. It's a tropical fish play centre with sharks, stingrays, sea turtles and even the elusive and enigmatic dugong thrown in for good measure … Global warming and the resulting rise in temperature of the earth's oceans has caused widespread bleaching of the rare coral, thus destroying the essential habitat of the reef's marine life. The reef needs its environmental warriors as well as its tourist trade to ensure its survival." "A 20,000sq km-sized slice of one of the earth's most geologically dramatic and biologically diverse wildernesses. The park supports four major river systems; has six different landforms, including estuaries, floodplains, stone country and the southern hills. There are over 280 different bird species, around 60 species of mammals, more than 10,000 insect species, and lots and lots of crocodiles … It is believed that Aboriginal people have inhabited the Kakadu region for more than 40,000 years, forging a deeply spiritual relationship with the region. There are more than 5000 Aboriginal art sites throughout the park, with some hosting rock art paintings over 20,000 years old, one of the longest historical records of any people in the world." "In a nation not short of natural wonders, the immense spectacle that awaits you in Australia's vast red centre is truly breathtaking. The solitary grandeur of the rock is worthy of every superlative you can think to throw at it; and even then no description can really prepare you for the sight of over 3.5km of solid stone in real life … The Pitjantjatjara tribe have called the area home for many thousands of years and there are many sacred sites around the base of the rock that have deep cultural and spiritual meaning. Learn more about the Dreamtime legends surrounding the rock at the Uluru-Kata Tjuta Aboriginal Cultural Centre, and take a tour of ancient cave paintings with Aboriginal guides." Shake up winter and escape with Cebu Pacific Air!